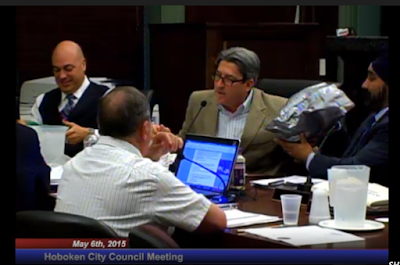 MSV: Horse Sense: Mile Square nanny state: Hoboken to ban plastic bags? Horse Sense: Mile Square nanny state: Hoboken to ban plastic bags? Last night the City Council began proceedings with a long presentation "made" by a number of Hoboken children urging government action imposing on the Mile Square City a ban on plastic bags. The kids were so cute and read their lines so well. The Nanny state informed the children to speak and so they did. They even got a standing ovation for their efforts. Other nanny state cities mostly on the West Coast have already imposed the ban forcing citizens to rely on e-coli ridden bags, often sold at heavily taxed prices when people show up in stores without on their trips leading to real human fatalities. Some contend those deaths may have origins other than due to banning plastic bags. During the presentation, one child noted the growing issue of dog poop on the streets of Hoboken. What handy tool is used most often to remove it and what will happen in Hoboken when that tool is no longer readily available? Add that to the list of misguided unintended consequences of government overreach. Put it in the pollution category; yet another so-called "problem" claimed to exist in the Mile Square. Only 18 percent of eighth graders were proficient or better in U.S. history in 2014. They scored slightly better, on average, than the eighth graders who took the first such test in 1994 -- but no better than those who took the test in 2010. The increases were on questions about democracy, culture and world role, but not on technology. When it comes to indoctrination of the nanny state however, kids are getting quite the lesson. Doesn't Hoboken government have enough to do? By the way, what did the novelty bags made by children arrive in for distribution? The imposition on local businesses if the nanny state succeeds in ramming it down their throat will result in another "benefit." Higher taxes for people forced to buy the anti-plastic bag "solution" at stores. Talking Ed Note: In an interview with Mayor Dawn Zimmer in 2011, MSV came out in opposition to banning plastic bags. Plastic is recyclable, employs tens of thousands of American jobs and does not cause Pelican cancer. Is your town trying to turn you into the nanny state of Portlandia? Do you want your kids to land up like this? This Horse Sense editorial is dedicated to all freedom loving Americans who resist the nanny state and using children to impose it upon us. Children need to be educated, not indoctrinated. This nation is failing - on both fronts. Perhaps that's the way the nanny state wants it.